Nobody told us in advance. Or if they did, it was in a briefing session when I wasn’t paying attention. There were plenty of those. The first hint we had was when we were coming down through the atmosphere. The air was full of moisture so thick that we could barely see the rest of the squadron. I waited for artillery to scream up from the ground and cut us to pieces. Would it be instant death or the long fall? It seemed like an age before we broke through the cloud cover and saw the city below us, defenceless. Our squad found one human survivor after the battle. An old white-hair. He was starved and exhausted and digging through the rubble with bleeding hands. We couldn’t explain it. Nobody should have lived through the barrage. Soldiers from other squads came to see for themselves because they’d never been close to a human before. We charged them a portion of their rations just to look at him and when the novelty wore off we kept him around as a mascot and a guide. I talked to him one evening and asked him about rain. He told me that the moisture stays in the sky because the air is warm but if the air gets cold for any reason then the water turns into droplets and gets pulled down by gravity. That’s how rain falls. Then it just sits on the surface all over the planet which I guess is the blue colour we saw from space. After a while, it gets reabsorbed into the air and just rises up by itself and then the whole thing starts all over again. I’m not sure about this last part. I haven’t seen any rain going upwards. He told me about soft rains and hard rains and drizzles and downpours. He told me about thunderstorms and cloudbursts. He had dozens of names for it but I couldn’t see why. It’s all the same to me when it’s soaking my uniform or shorting out the electronics in my weapon. He told me about the snow that would come in winter and how it would cover the streets and how people would skate on the canal. I didn’t want to be fooled by his stories. I told him this but then he showed me a glass globe he carried. You could shake it and you’d see white flakes swirling around and settling on the little city that was inside it. His city, he told me, the first one we’d levelled. When we moved out into the countryside I realised that he was right about the rain. About it being more than just moisture and air and gravity, I mean. That’s all it is but at the same time that’s not all it is. I don’t know how to explain it. I saw it first when I was weaving around the blast craters in the big-wheel. The craters were full of water. 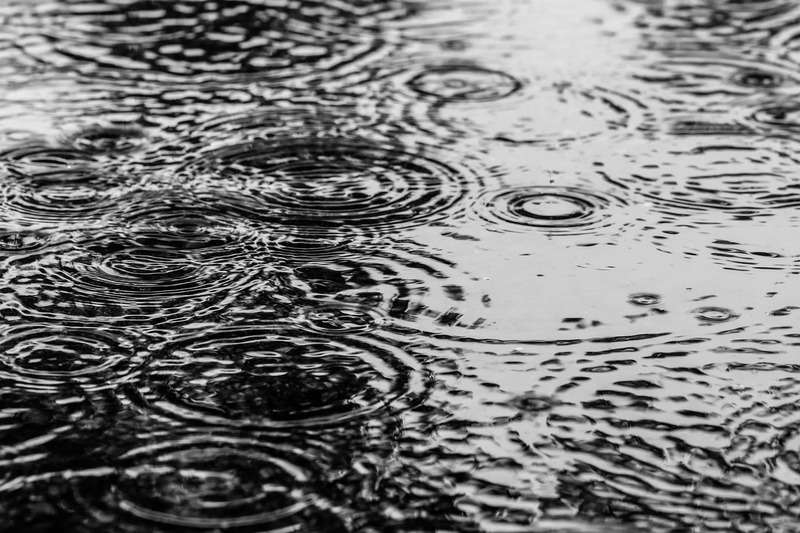 The rain pelted into them and made pockmarks that rippled outwards in perfect circles, quicker than the eye could see, overlapping and rolling into each other and through each other and fading out to nothing and then blinking into life again. It was hypnotic, like watching shockwaves from orbit. Outside of the area of the searchlight beam it was too dark to really see the rain falling but you’d see it where it struck the bulletproof windows and you’d hear it tapping on the roof. I pressed my finger on the cold dry inside of the glass and traced the path of a drop as it zig-zagged down the outside. There was something comforting about being warm and dry in the vehicle with the storm so close. It was like we were inside the old man’s snowglobe but the weather was on the outside. It’s something you have to experience. And there was that time we were in a forest on foot, doing a sweep-and-destroy for humans. It had stopped raining for the first time since morning and a kind of, I don’t know, greensmell, was rising up from the floor and making everything different. I didn’t know that smells could have a colour. ‘Petrichor’ is what the human called it. Fat drops were hanging and wobbling on every leaf and all along the branches. I reached up and grabbed a branch and shook it, and it was like it was raining again for a second or two. The human laughed. The rest of the crew just made howls of complaint and shook themselves dry but to me it was beautiful. At the end of the campaign we came back to the city and we parked at the side of the river. It was wide and fast at this place because we weren’t far from the sea. We got out of the vehicles to stretch and we stared out over the flow. Even after several months it was strange for us to look at. The human got out too and he walked to the edge of the water and looked across at the rubble on the far side. Then he did an odd thing. He stepped into the river and kept walking until the water was up to his chin and then he went under and we lost sight of him completely. We didn’t see him after that. We thought maybe he swam away or he walked along the bottom of the river and got out again upstream. Or maybe he was just hiding under the water and waiting for us to leave. I don’t know if humans can do that. And if they can, I don’t think our guy could. He was pretty old. I have his snow globe. I’m bringing it home in my ammo pouch as a souvenir of the mission. We’re probably leaving the planet soon. The commander thinks that we’ve done enough and there’s no point in chasing down the last of the humans. Some of the older guys disagree and think that we’re going to be here for a while. They say that the humans are regrouping in the far north and we need to finish them off properly. I hope that’s true. I’d like to see real snow before we leave. Thank you for reading. Please consider sharing by clicking one of the social media buttons below. Next Dublin at night – more photos.